On my Thanksgiving table there is usually an apple pie, a pumpkin pie, and a chocolate pie. Treats are always a highlight of the meal that comes an hour or so after the Turkey and a change into yoga pants. I thought it would be fun to go in search of some new treats at one of my favorite local bakeries: Wuollet’s. I am usually found in Wuollet’s browsing the cupcake section for a co-workers birthday. My favorite is the red velvet cupcake. Now, try to stop yourself from running from your desk to the closest baked good after looking at all these pictures. But, I thought it would be fun to share some new ideas for your thanksgiving table. Why not try a special pie? 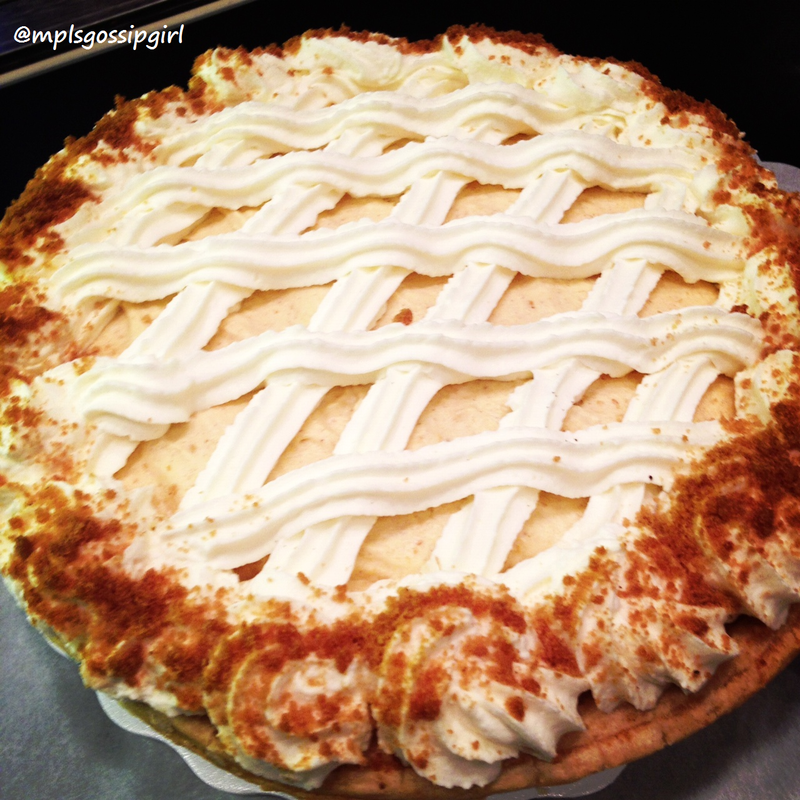 Wuollet’s has a Pumpkin Chiffon pie that is out of this world. It is traditional but fancy at the same time. 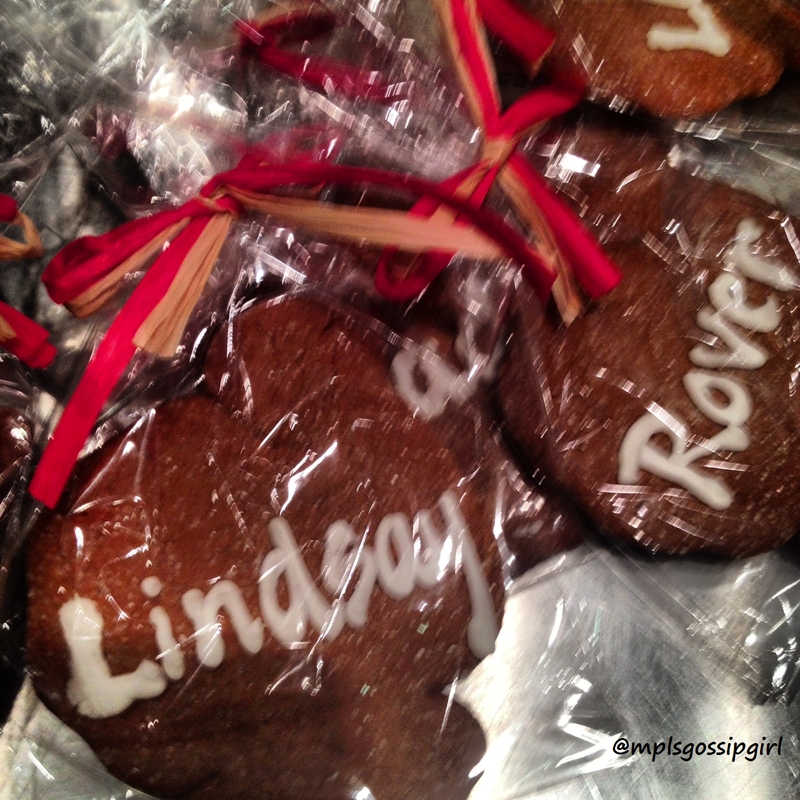 Decorate your table with cookies with each attendee’s name on it for a fun way to show everyone where they are sitting. Wuollet’s will write the names on the cookies for you. If someone doesn’t show you can eat their cookie. I love this idea because it is a fun way to decorate for this special occasion. I thought about my family and how we never know who exactly is coming to thanksgiving so we might do our last name or fun Thanksgiving words on each one. You could turn it into a fun way to sit by someone new by having each person draw one of those words from a hat. Get a few dozen croissants or rolls to eat with your leftovers the next day/week. Eating a turkey, cranberry, goat cheese, and a little bit of stuffing sandwich as lunch for the week after Thanksgiving is a tradition for me. Make sure you clearly label your sandwich in the office communal refrigerator or someone may “accidentally” eat yours. 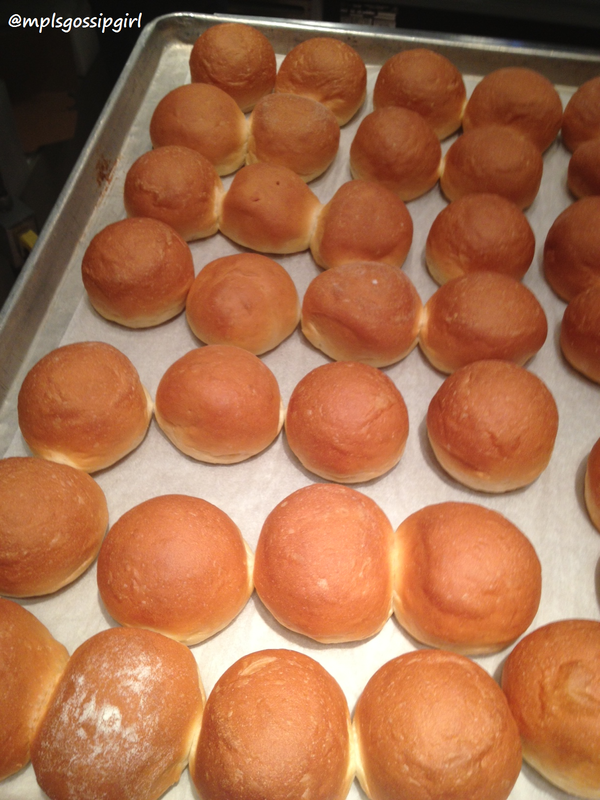 Or I guess you could bring rolls and share with everyone, if you are nice. If you don’t feel like a pie, get a cake. Wuollet’s has professional cake decorators that can make almost anything a reality. I mean seriously, a turkey cake? That is amazing! If you would like a cake that looks like a perfectly baked turkey, cornucopia, or if you want your weird uncle Sal in a chefs hat eating a turkey leg made out of frosting on the top of a cake. I bet they could and would do it. They have decorators who are professional artists, who have worked there over 30 years, and who are part of the Wuollet family. With all of that talent they can make cakes that should be in a museum. You could also get a fancy cake as well, which you can find in the rotating cake case. I have had carrot cake before at Thanksgiving and that really hits the spot. One of my favorite items at Wuollet’s is the cupcakes. Obviously. They have turkey cupcakes in their window that would be fun if you have little children in your family or if you needed something to decorate with. They can easily be eaten afterwards. 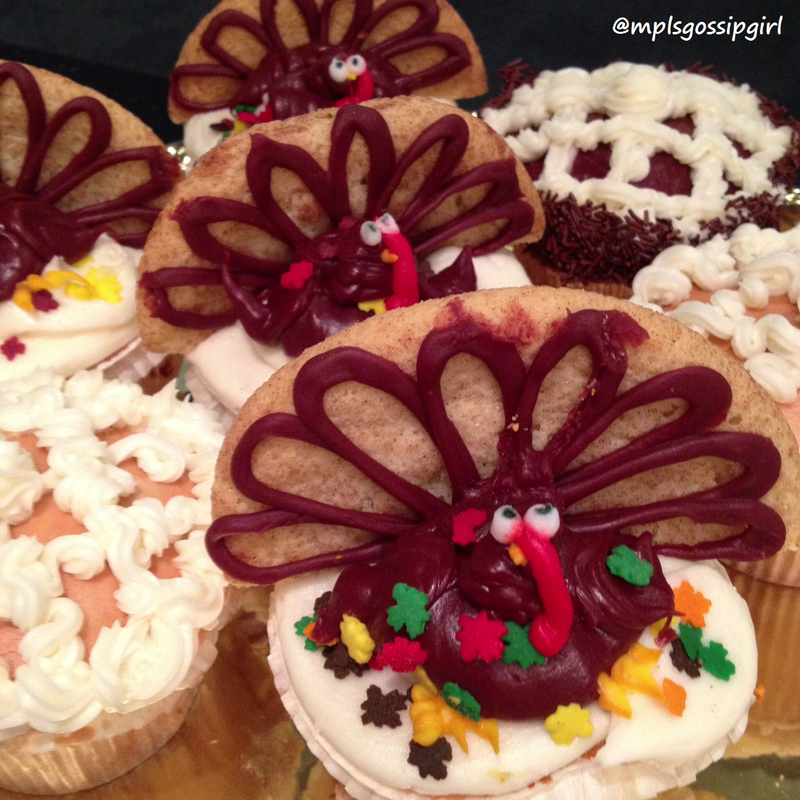 They can also do cupcakes in the shape of a cooked turkey which are hilarious. So, if you often have trouble with the actual turkey you can bring the cupcakes out and show people how perfect you made the turkey this year. The best part of all of this is that you can order it next Tuesday and pick it up on Wednesday. It is really convenient for me because I work downtown Minneapolis. I can easily stop by on my lunch hour on Wednesday and grab the items for the next day. If you do want a very custom order I would contact Wuollet’s a few days ahead of time to make arrangements. Since they are a full service bakery if you made a mistake and need to order something at the last-minute, they will do their best to get you covered. 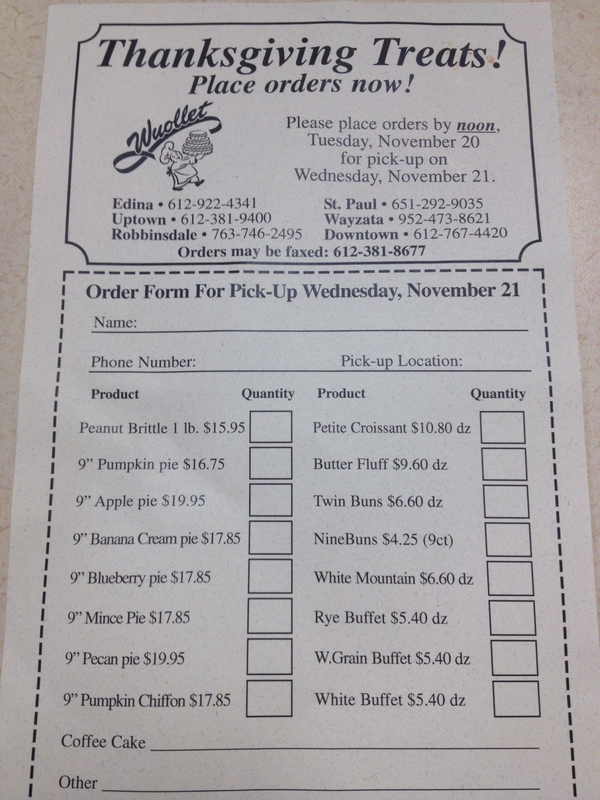 For Thanksgiving they have these handy ordering sheets that you can pick up in any of the locations. It is easy, has all the prices, and takes the hassle and stress out of Thanksgiving. You can go to Wuollet’s website to see more information about their locations HERE. Mplsgossipgirl is putting on a contest. 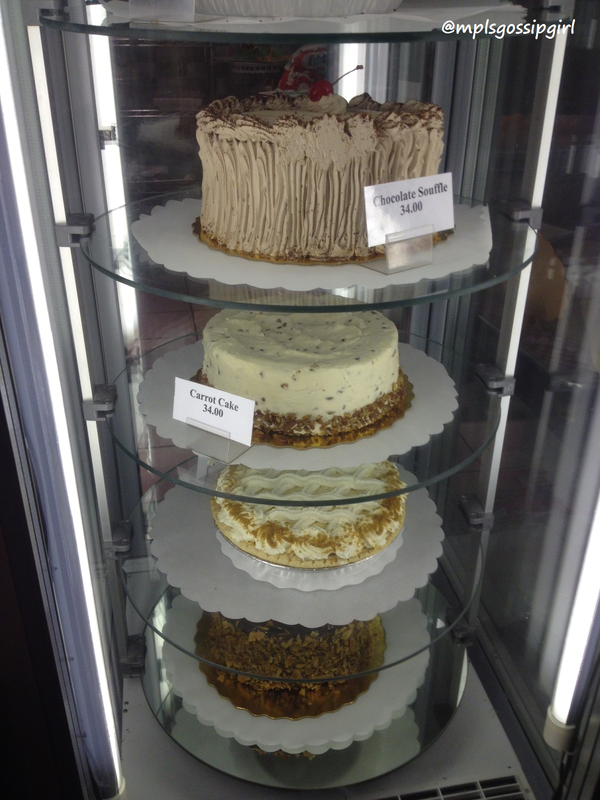 The downtown Wuollet’s has a window where they display beautiful and creative cakes. They also help their clients design custom cakes for their special events, which is something I love about this local business. If you could have a custom designed cake at your Thanksgiving table, what would it look like? The best ideas will win a cupcake. Although, I am sure my crazy uncle in a chef’s hat eating a turkey leg is a great idea to put on a cake. I bet you can come up with some of your own cake ideas for Thanksgiving that will rock. 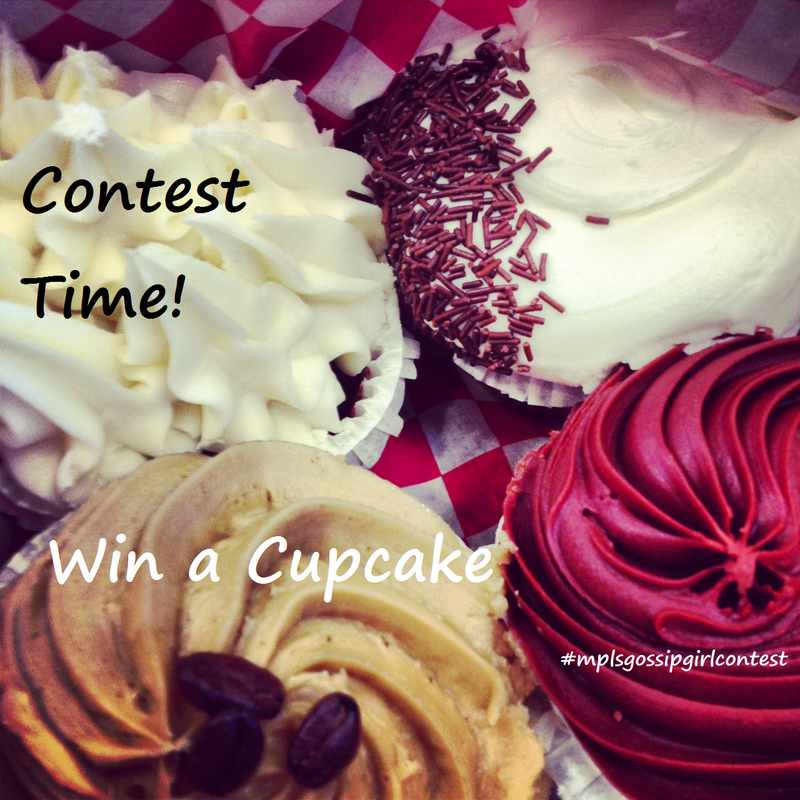 I will mail the winners a token to get a cupcake at any of the Wuollet’s Bakery locations. It is only open to those with an address in the Twin Cities in Minnesota. You do not have to follow, like, social media the heck out of me to win. This blog will never require people to do these things to enter a contest. I want you reading my posts because they are entertaining. Leave me a comment on this post describing your idea. (It is up in the black box in the left hand corner) If you don’t already subscribe to mplsgossipgirl right now would be a great time to do it and you can by clicking in the right hand corner of my blog. You will have to leave me a way to get ahold of you though, so please leave your Twitter handle and if you don’t have one of those if you are a winner I will comment on your post. So, make sure you have it set to notify you. Tweet me @mplsgossipgirl. Tweet me your idea to #mplsgossipgirlcontest. 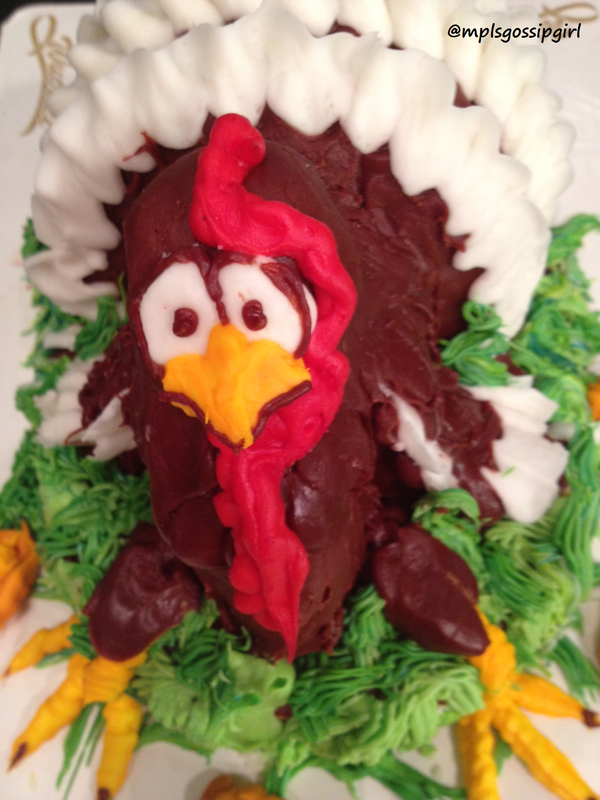 Most importantly, go to my Facebook page Mplsgossipgirl and comment under the picture of the Turkey Cake with your idea. While you are there like my page and share it with your friends too. You can enter in all three places and more weight will be given to those who have the most likes/retweets/comments on them but ultimately it will be my decision. I am looking for really creative and fun ideas. Please keep it PG and PC. Contest will end at Midnight on the 21st of November, 2012. Winners will be announced the next day, Thanksgiving. As always, on Thanksgiving I like to remind those around me that if you are deep-frying your turkey, please make sure it is completely thawed and you are outside and not in the garage. That is my PSA for the day. because a unique cake will be talked about for years to come. Disclosure: This is a sponsored post. All views and opinions are my own.